Just as you have smart home automation features throughout your property, you can install this tech in your home theater and make it stand well above a standard cinema. By bringing motorized shades and lighting control to the room, you can create the perfect environment for watching a film. Lower the automated shades and turn off the lights to create an immersive atmosphere, and have the whole entertainment system turn on all at once – with just one press of a button. While these smart features enhance your movie-watching, they can also take the space in other directions. Raising up the shades to let the natural sunlight in can switch over a darkened home theater from a quiet, private place, to a more warm and comfortable area that friends and family can hang out and chat in. Brighten the lights to make it easy to see once the sun goes down, or dim them to create ambiance, which encourages conversation and camaraderie. When you’re watching an action-packed film or a suspenseful drama, you want the highest-quality of screens and speakers for your audio video performance. But how can you avoid the obtrusiveness of AV equipment when you want to use your home theater space for entertaining guests or drinking coffee with friends? That’s where hidden audio video features come into play. With in-wall and in-ceiling speakers, you’ll be able to hear your media with clear precision, without sacrificing your interior design and style. These speakers are virtually invisible, and only their excellent delivery will let you notice that they’re there. The same goes for your TV or projector screen. Put up a display that doubles as a mirror when not in use or install a wall panel that can slide down over the screen to reveal artwork when you’re not watching. Roll-down projectors and screens or displays that can roll down into a piece of furniture are also ideal. These features disappear without a trace when you’re through watching something and want to use your theater for another situation. Then with a push of a button, they can instantly appear again, ready to play a film or show. 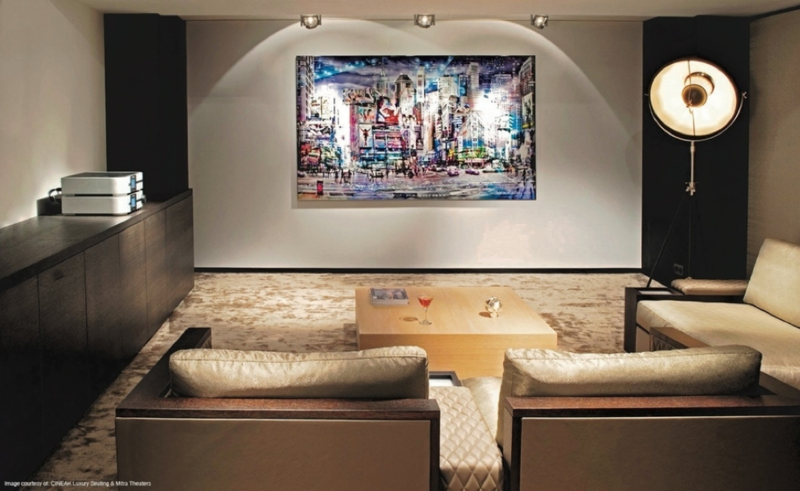 Create the ultimate multi-purpose viewing space with these smart solutions. Want to learn even more about hidden AV features and smart home technology for your Frisco, TX home theater? Feel free to give us a call, chat with us on the bottom right, or fill out our online contact form to schedule a no-obligation consultation with our team. We’d love to hear from you!